This is a collection of the best children and kids WordPress themes ideal for childcare, kindergarten, pre-school, day care centers, crèche, primary schools, kids toy shops, children’s party businesses, children’s learning and activity blogs, and other types of children’s website or businesses that cater to children, or sell kids products. These kids WordPress themes are typically colorful, fun and playfully designed making them ideal for any sort of website and business in the children’s market. 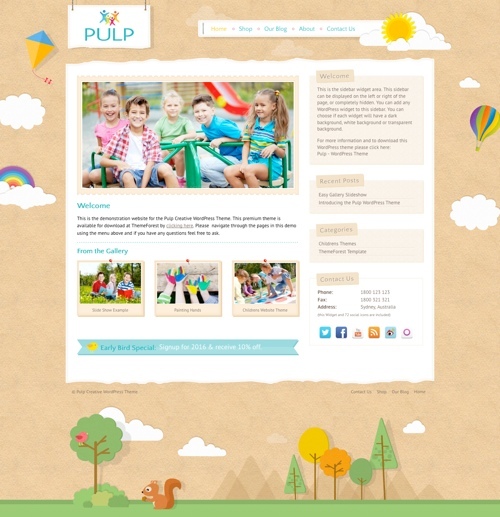 Kids Play is a joyful and colourful WordPress theme designed for kids websites. The premium theme from ThemeFuse is suitable for any type of kids related website – kindergartens, child care centres, crèches, after school care, day care facilities, parties, art and craft classes, businesses and shops catering to children and others. It has a playful design and lots of nice features. Kid Quest is a child and kids oriented WordPress theme designed for kindergarten, preschool, childcare centres, day care facilities, playgroups and other related kids websites. The premium theme from ThemeFuse has a fun and friendly design with playful icons. Some of the key features and benefits include: pre-defined layouts for children’s activities, powerful visual page builder, color customization options, Google fonts, and lots of customization options. Kiddz is a WordPress kindergarten theme suitable for kindergartens, child care centers, preschools, nurseries, primary schools, and other websites catering to children. The premium theme from 7Theme has a colorful and fund design and is bold and modern. The custom homepage has a slider followed by custom sections to display information about your establishment. Some of the key features of the theme include: customization options (colors, fonts, backgrounds, logo etc), advanced typography options, schedule section, custom post types for teachers, classes and locations, unlimited sections and portfolios, unlimited sidebars, gallery template, social icons, mega menu, retina ready icons, comprehensive options panel and more. Kiddo Turf is a gorgeous WordPress theme designed specifically for children’s websites. 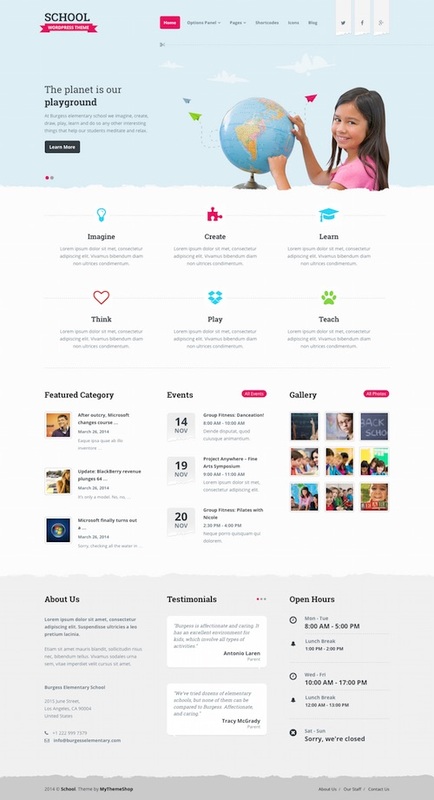 The premium WordPress theme from Theme Fuse has a fun and colorful design that would be perfect for kindergarten websites, pre-schools, child care centers, kids party websites, or any other type of kids type business website or blog discussing children’s activities. The theme has some amazing background illustrations and a custom homepage design with a featured slider and sections for any other content you would like to place on the homepage. It has a photo gallery template, staff page template, testimonials page, blog page and contact page with a contact form, contact info and Google map. Everything a business websites needs. Kiddo Turf is built on the TFuse framework and has a powerful admin options panel to help you easily set up and control your website. It’s also mobile ready with a responsive layout. All of the theme elements scale and resize depending on the device the website is viewed on so it works on iPads, iPhones and all other mobile devices. 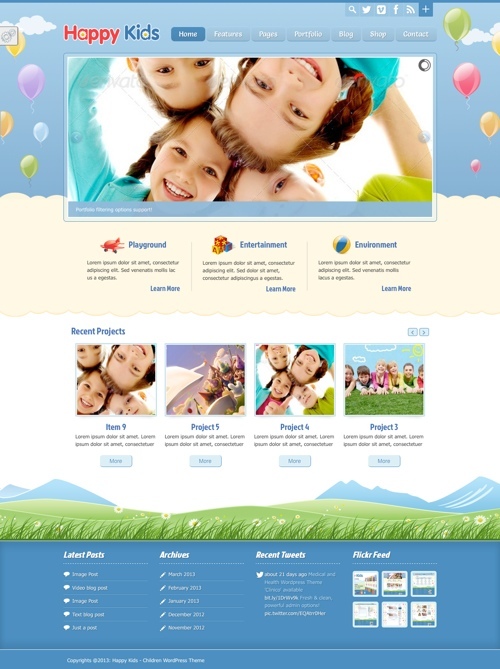 The School theme from MyThemeShop is a premium WordPress theme designed for elementary and primary schools, day care centers, crèche, kindergartens and other education establishments and programs. It has an education oriented design with a clean and light color scheme and custom post types to display information about your school. Some of the key features of the theme include: a mobile friendly responsive design, custom post types for events and gallery, unlimited color options, Google fonts, custom slider, HTML5 and CSS3, testimonials section, open hours widget and 15 other useful widgets, retina font icons, mega menu, and more. 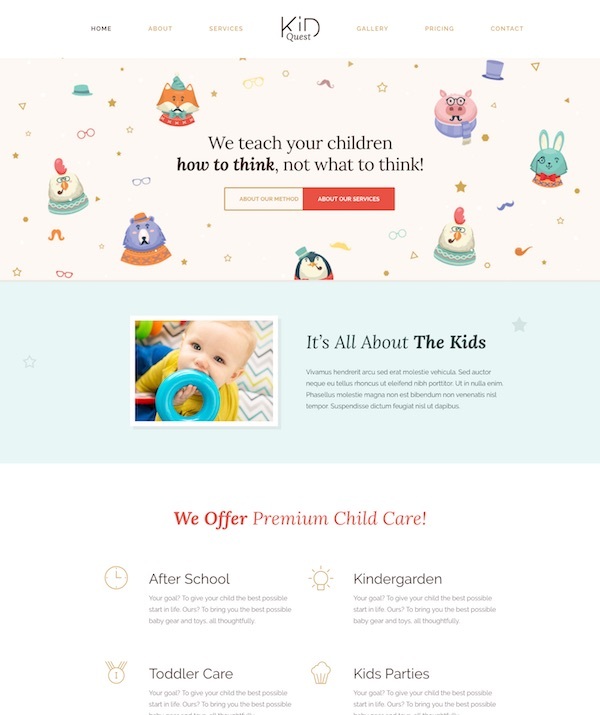 Child Care Creative is a premium WordPress theme designed for the child care industry and also suitable for any children’s, art, craft, creative or environmental website. 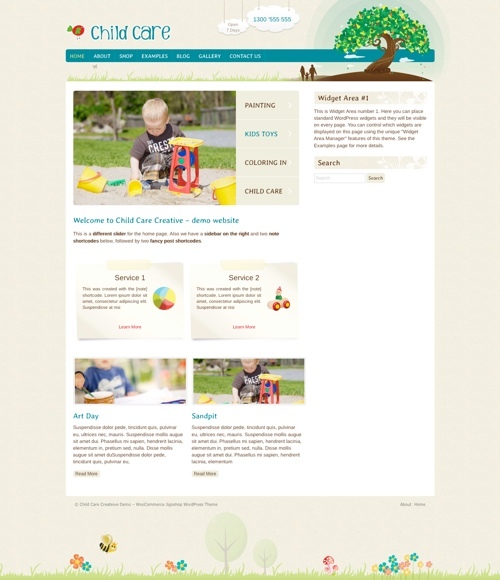 The theme has an earthy illustrative design ideal for day care centres and related websites. Some of the key features of the theme include: a custom homepage design with slider and sections for important information, header options, custom widgets (contact us, Google maps, social icons), blog, photo gallery, shop section and more. Happy Child is a mobile friendly WordPress theme created for kindergartens, professional child care centres and pre schools. The premium theme has a modern and professional design with a lot of great features to help you quickly and easily create your website. Some of the key features of the theme include: 3 different homepage layout options (kindergarten, school and courses), 3 header styles, a visual drag and drop page builder (so you can easily create your own page layouts), extensive styling options (unlimited colour options for every element and widget), slider, different portfolio styles, Google fonts, CSS3 animations and parallax effects, video and image background options, a retina ready and responsive layout, WooCommerce support, boxed or wide layouts, mega menu and more. The Carry Hill School theme is a responsive WordPress theme with a modern, professional and yet fun design ideal for primary schools, child care centres, kindergartens, and other children’s websites. The premium theme comes with a drag and drop page builder so you can create your own custom page layout / content with ease. Some of the other key features include: a premium slider, font awesome icon sets, powerful and easy to use theme options panel, unlimited colour options, 9 pre-set colour schemes, 500 Google webfonts, 5 page templates, RTL support, shortcodes, translation ready and more. The Kids Voice School WordPress theme has a beautiful and appropriate design for child care, kindergarten, day care centres and other children’s websites. Some of the notable features in the theme include: a mobile responsive design, 10 colour scheme options, customizable slider, custom widgets and shortcodes, unlimited sidebars, AJAX contact form, gallery custom post type, and more. 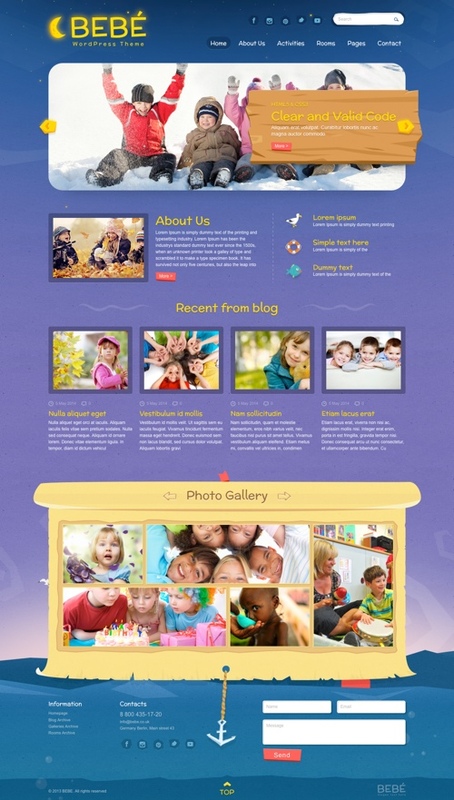 BeBe is a WordPress theme with a responsive design ideal for kids websites such as child care and kindergartens. It has a playful and fun design with some nice animations. Some of the key features in the theme include: lots of shortcodes and widgets (alerts, tabs, columns, slider, toggle etc), translation and Multilanguage ready, different typography options, theme options, and more. Sunny Kids is a premium WordPress theme with a heap of great features and perfect for children’s websites and child care industry businesses. Some of the key features of the theme include: a unique a creative design, homepage slider, Google fonts and maps, easy theme customizations via the WordPress customizer, a mobile responsive layout, ecommerce support with WooCommerce, footer and background customizer, easy sidebar manager, 3 different footer options, and more. 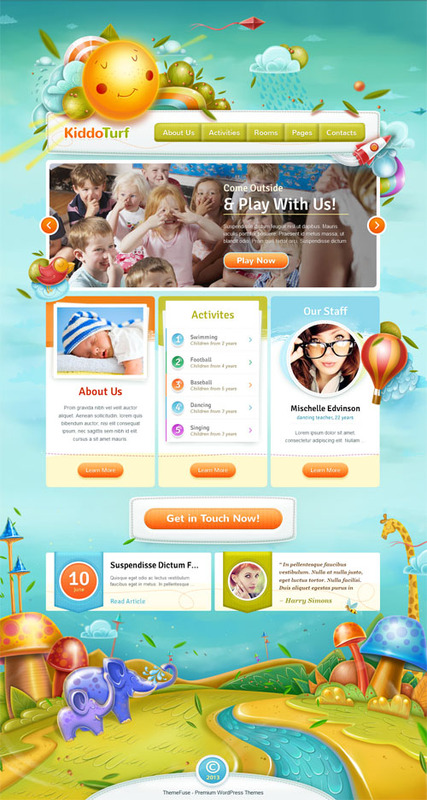 The beautifully designed Kids Zone WordPress theme has been created for kindergarten, Day care, and preschool websites. 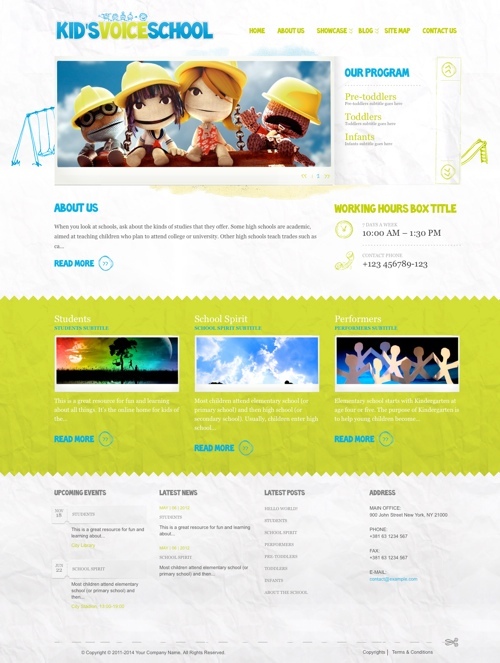 The premium theme is also suitable for any children, art, craft, school and training website. The theme is mobile friendly with a responsive design and packed full of great features. Some of the notable features include: 6 different homepage designs, 4 creative gallery designs, hand crafted slider animations, WooCommerce support and styling, mega menu system, support for Event Calendar Pro, bbPress and BuddyPress, visual shortcodes builder (for buttons, price tables, services list, team, quotes, contact info, testimonials etc), typography manager, Mailchimp newsletter integration, responsive styled Google map, 3 gorgeous colour styles, unlimited sidebars, easy colour management, HTML5 and CSS3 code and much more. The Kindergarten WordPress theme is a mobile friendly premium theme with a modern and professional design. It comes with a stack of great features and premium plugins to make it easy to setup and manage your kindergarten, child care or school website. Some of the key features of the theme include: 10 homepage layouts, infinite header customisation options, slider, super menu system, interactive AJAX search, parallax and video backgrounds, 9 different blog styles, portfolio, rating and review system, a visual composer and shortcode builder, WooCommerce support, Google fonts, translation options and more. The Happy Kids WordPress theme has a clean and simple design suitable for kindergartens, child care centres, pre schools and other small businesses catering to children. The premium theme has a mobile friendly responsive layout and is built using the latest HTML5 and CSS3 standards. Some of the key features of the theme include: 6 colour scheme options, 9 different background patterns, easy colour and font management, WooCommerce compatibility, video post support, various page layouts, portfolio gallery pages, unlimited sidebars, theme options and more. Peekaboo is a children WordPress theme with a mobile friendly design suitable for day care or school websites. The theme is flexible, feature rich, simple to use and has all the tools you need to build a school website or a small business site. Some of the key features of the theme include: a responsive slider, unlimited colour schemes, shortcodes, advanced option panel, sticky navigation menu, Google fonts, logo uploader, custom background images, custom page templates (contact, testimonials, gallery etc), custom widgets, localization options and more. The theme is built with the Foundation Framework, SASS and Compass. 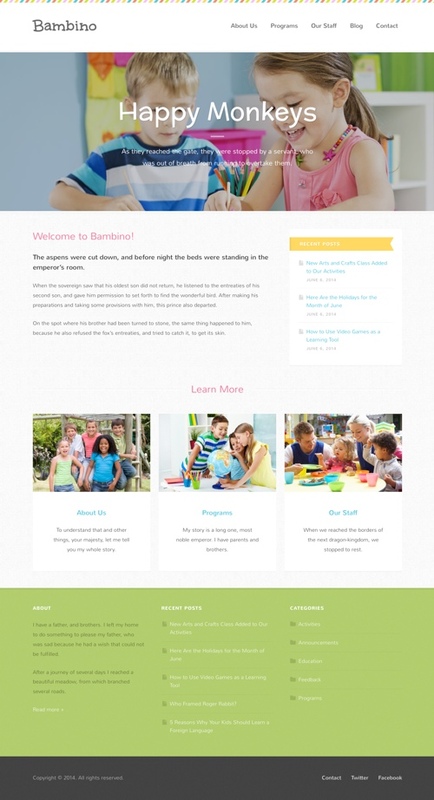 The Bambino WordPress theme is designed for day care, kindergarten, baby sitting agencies and nurseries. The premium theme has a fun and colourful design. It doesn’t have a complex framework and relies on as much core WordPress functionality as possible why still providing enough flexibility in terms of design and layout. The theme is based on the underscores starter theme from Automattic so you know it has valid, secure, SEO optimized code. It also has lots of white space, great typography and pixel perfect design elements. Some of the other key features include: unlimited colour schemes, grid page template (for programs, people services etc), multiple blog layouts, and Theme Customizer support to upload your logo, make different tweaks and choose a blog layout that works for you. 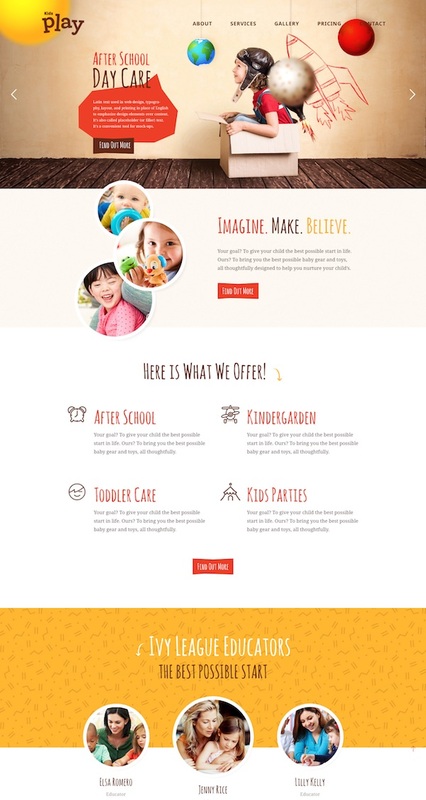 Magiccreche is a premium WordPress theme designed for crèche, kindergarten, pre school, primary school and related websites. The theme has a modern and professional design that allows you to present all the important information on the homepage. It has a mobile friendly responsive layout and is retina ready. Some of the other key features of the theme include: unlimited colours with a colour picker, unlimited Google fonts, Google maps with unlimited locations and pinpoints, a timetable schedule (for classes, lessons plans, mean plans, etc), staff slider to show your team, font awesome icons, theme options panel and more. Pulp is a simple WordPress theme with some unique illustrations and animations in the design that would be suitable for childrens, kids, family or art themed websites. Some of the key features of the theme include: a mobile friendly responsive design, easy sidebar manager, widget background options, easy customization options, WooCommerce and Facebook integration, Google maps, social icons, fancy blog post layouts, photo gallery and more. 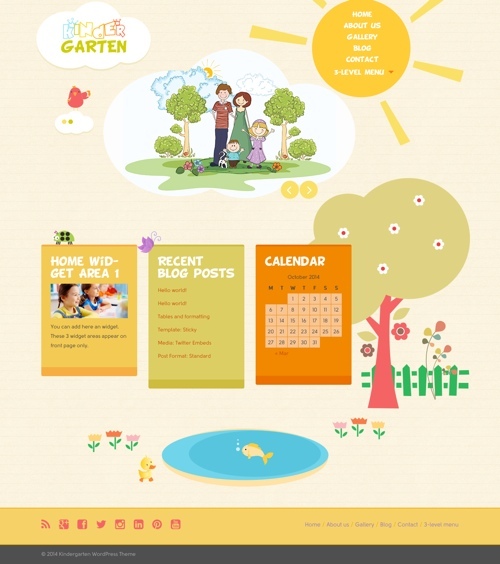 Kindergarten is a WordPress theme with a responsive layout built for kindergartens, nursery, preschool, or any other kids-themed websites. It has a very unique and colourful illustrated design. Some of the key features include: a slider in the shape of a cloud, custom contact page with Google map and contact form, custom filterable image gallery with albums, various post formats, custom front page with multiple page templates, JetPack plugin compatibility, and more. Babysitter is a WordPress theme designed for babysitters, nannies site, mom blog or other baby oriented sites and businesses. The premium theme has a clean, flat and mobile responsive design. Some of the key features include: theme options to easily manage the theme, unlimited colour options, jobs listing functionality, shortcodes, font awesome icons, post formats, Google maps and fonts, pricing table, translation ready and more. 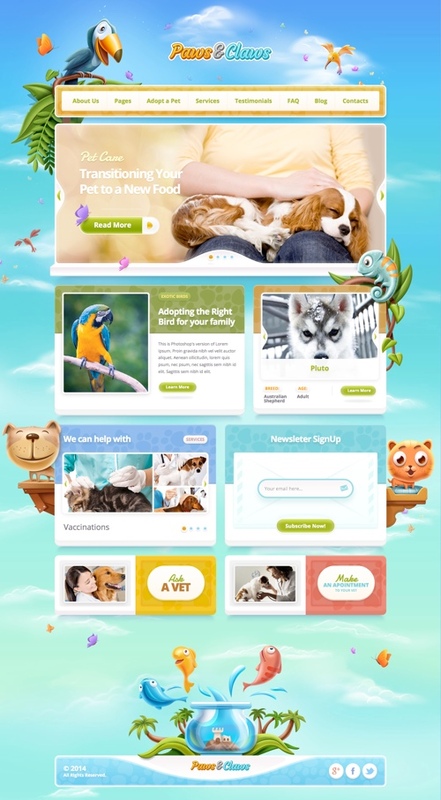 Paws and Claws is a cool WordPress theme that would work well for a children’s website, child care business, pre-school or other kids sites thanks to its colourful, and fun design. The premium theme from ThemeFuse is mobile friendly with a fully responsive layout that works great on large monitors, tablets and mobile phones. It has some unique animal illustrations and simple, easy to use structure. Some of the other key features include: 2 different sliders, lots of pre-made layouts, appointments, services, FAQ and blog pages, an events calendar, pricing table, contact page, colour change options, mega menu, typography options, and lots of shortcodes.